NextGenLog: #ROBOTICS: "Music Buddy Heralds Helper Robot Revolution"
#ROBOTICS: "Music Buddy Heralds Helper Robot Revolution"
Here is what Georgia Tech says about its Shimi robot companion: Wedding DJs everywhere should be worried about job security now that a new robot is on the scene. “Shimi is designed to change the way that people enjoy and think about their music,” said Professor Gil Weinberg, director of Georgia Tech’s Center for Music Technology and the robot’s creator. He will unveil the robot at Wednesday’s Google I/O conference in San Francisco. A band of three Shimi robots will strut its stuff for guests, dancing in sync to music created in the lab and composed according to its movements. 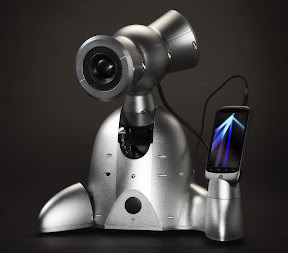 Shimi is essentially a docking station with a “brain” powered by an Android phone. Once docked, the robot gains the sensing and musical generation capabilities of the user’s mobile device. In other words, if there’s an “app for that,” Shimi is ready. For instance, by using the phone’s camera and face-detecting software, the bot can follow a listener around the room and position its “ears,” or speakers, for optimal sound. Another recognition feature is based on rhythm and tempo. If the user taps or claps a beat, Shimi analyzes it, scans the phone’s musical library and immediately plays the song that best matches the suggestion. Once the music starts, Shimi dances to the rhythm. Future apps in the works will allow the user to shake their head in disagreement or wave a hand in the air to alert Shimi to skip to the next song or increase/decrease the volume. The robot will also have the capability to recommend new music based on the user’s song choices and provide feedback on the music play list. Weinberg hopes other developers will be inspired to create more apps to expand Shimi’s creative and interactive capabilities, allowing the machine to leave the lab and head into the real world. “I believe that our center is ahead of a revolution that will see more robots in homes, bypassing some of the fears some people have about machines doing everyday functions in their lives,” Weinberg said. Weinberg is in the process of commercializing Shimi through an exclusive licensing agreement with Georgia Tech. A new start-up company, Tovbot, has been formed and Weinberg hopes to make the robot available to consumers by the 2013 holiday season. Shimi was developed in collaboration with the Media Innovation Lab at IDC Herzliya and led by Professor Guy Hoffmann. Entrepreneur Ian Campbell and robot designer Roberto Aimi were also part of the Shimi team. This is the third robotic musician created by the Center for Music Technology. Haile is a percussionist that can listen to live players, analyze their music in real-time and improvise with music of its own. Shimon is an interactive marimba player. This project is supported by the National Science Foundation (NSF) (Award Number HCC-1017169). The content is solely the responsibility of the principal investigators and does not necessarily represent the official views of the NSF.